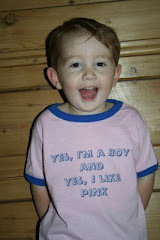 Thanks to the blogging world, I got inspired to create my own line of t-shirts for little lads (and big ) who like pink. Check out my Gallery at Zazzle.com. MANY THANKS.